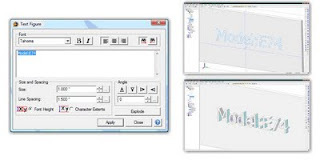 Alibre Design will offer a 3D-text feature tool allowing text to be added as a parametric part feature. Individual features will support colour change for better identification, and the user will also be permitted to set the default 3D new part colour. Edit commands will include multiple clipboard paste in "rubber stamp" mode. Toolbars will be more customizable, and additional box select modes will speed up editing. Editable 3D section veiws, colour schemes and light sources are also supported now. The Alibre Sketcher will display missing constraints as degree of freedom callouts (with configurable colourisation). It will also offer optional real-time dimensioning and placement while geometry is drawn, rather than requiring this be completed as an additional design step. This option saves users considerable time in constraint specification. Alibre Sketch will also offer quick bi-directional conversion between model sketch figures and reference geometry. Constraint and snap options for drawing have been added, as well as a new axis mirror option. 2D drawing space will support a new freeform table creation for relevant model data fields. Alibre version 12 files will offer a convenient thumbnail view from both Windows Explorer and Alibre Vault PDM, which makes file selection easier. The assembly space move and rotate commands have been merged into a single dialogue for faster model placement by the user. Assembly part arrays / patterns now offer placement preview. View performance for large assemblies has been greatly improved. Contour and lofted flange support is added. Now sheet metal designs can include tapered corners or profile flange with variable radius along its length. These "lofted flanges" are nicely flattened in Alibre (along with the rest of the part) for the initial pattern stamp or cut-out. For more information about Alibre 12 improvements, feel free to contact CADDIT in Australia HERE. There is also a downloadable PDF version of this list available HERE.